In trying to abide by my: maintain and sustain health goals, I decided I would do Whole30-ish. Right now I am of the “ease into this” frame of mind. I am determined to not overwhelm myself but instead to organically let my health choices become health habits. The rigidity of Whole30 is too much for me to put my blinders on and go in full throttle (at this moment). I would like to consider doing the “real deal, full on” in August or October. Feb 1st I became fully committed to removing things from my food catalog that were not part of the program. What is Whole30? In my simplest terms – it cut’s out some things that can cause your body distress and after thirty days of having these items removed, reintroduces them one at a time to see if your body is better with or without them. That is my perception of the program. I know I reduced it to one sentence and it is much more dense than that. But, for the sake of not making this a mile long blog – it is what you get. So, what kinds of things does this program cut out? Legumes: I know what you’re thinking “Wait, beans are healthy!” And I think they are for some. Beans are nutrient-binding and prevent some of the benefits of other vegetables to play out. The difficulty in digesting beans is because of the type of carbs they contain (this leads to the gas, bloating and cramps). Soy is frowned upon because it can sometimes be processed by your body like estrogen and is noted as throwing off your hormonal balance. And do not forget peanuts are also legumes. This will be difficult for me because beans are a staple in my house. Dairy: That includes all dairy from cows, sheep and goats (yogurt, cheese, milk, soy). While milk is great for little infants, it is not as great for adults. This is because of Lactose and Casein and their interactions with our bodies. This will not be difficult for me because I do not drink milk, sparingly use cheese and only in the summer do I consider having an ice cream cone once a week. Sugar: In addition to white sugar, this includes honey, agave, maple syrup, Splenda, artificial sweeteners, fermented sugars, alcohol. Sugar is high calorie and low nutrition. It is also addictive. Too much sugar leads to metabolic issues. And as for the artificial sweeteners, studies show that using them increases your sweet cravings. This will be difficult for me because of the abundance of sugary goodness everywhere in my life. Grains: These include oats, barley, corn, quinoa, millet, rice or buckwheat. Grain can create an imbalance of good bacteria in your gut, which will cause inflammation throughout the body. Similar to legumes, it will be difficult for me because they are a staple in our diet. So what’s with my “ish”? January through March I have/had a number of things planned on weekends, well…every weekend actually. It is difficult to eat on the fly and follow this program to the T. I do like the concept of this program, the eating clean aspect. I know that realistically I will not be able to do it fully at this moment. 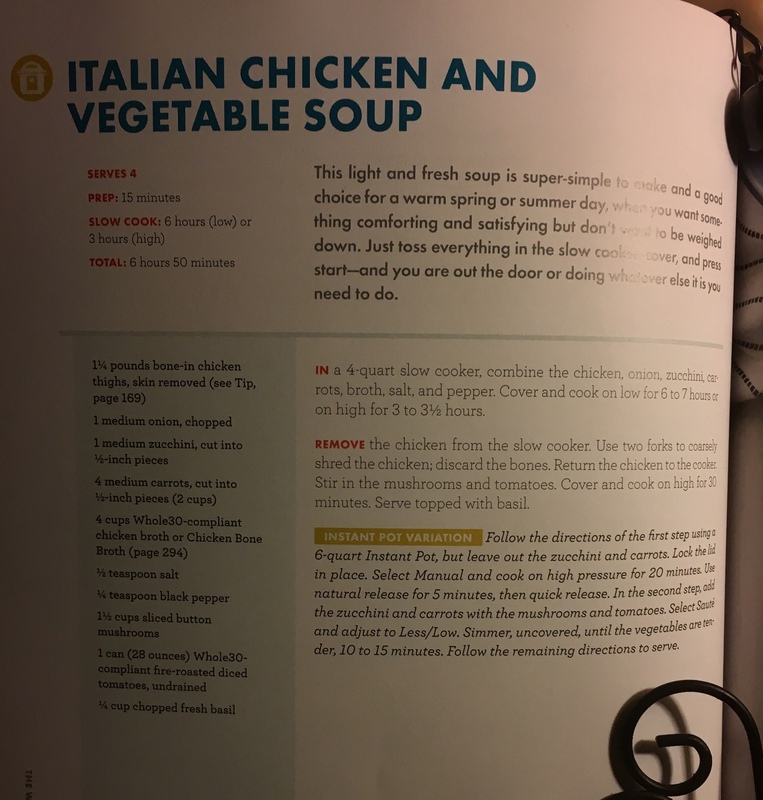 BUT that does not mean I cannot start conditioning myself by pulling things out of my food catalog ahead of time to prepare me for a time when I can fully commit. I sluggishly started in January and became more serious about it in February. Going forward I will be more aware of the food I consume. Legumes – this is a little difficult for me (edamame with my sushi during a weekend in MA, green beans at Mom Dolin’s house because hers are the best). In January I was using black beans in my morning scramble. I removed that Feb 1. It is not a horrible thing, not eating beans. Wintertime will be the hardest for this removal because cold days go hand-in-hand with either chili or pintos/cornbread. Dairy – easy breezy. I have removed cheese and butter. I have not used fluid milk in a while (I trained myself to like black coffee because of camping and milk needing to be refrigerated). Cheese was once consumed in the form of cube snacks for work and the occasional sprinkle on a meal while eating away from home. That has stopped. I have replaced using butter with olive oil in my cooking – I was fine with either, so it is not a real “loss”. Sugar: this one is the most important to me. I lost two parents to health issues that had type 2 diabetes as an underlying factor. And I know that sugar is not the only culprit, carbohydrates also play a major role as well as physical activity. However, sugary sweets and drinks were a staple in my childhood home and, as an adult. sweets are still my weakness. On the job, there is an abundance of sweet snacks, candies of every nature, donuts, etc. It was a regular thing (primarily on more stressful work days) to walk into the storeroom and grab mini peppermint patties or bite sized Hershey bars. While I was there maybe I would pick up a bag of chips. That stopped January 1st. I have made a concerted effort to stay out of the storeroom office and away from those sweets. Out in the real world it has proven more difficult. Pam makes amazing cookies and both in DC and in MA I had several. She also made my favorite coconut pecan icing for a sliver of cake set aside for me during Birthday Bowl Weekend. While celebrating Husband’s birthday in Dayton I had cheesecake (suffered afterward so I learned a lesson). Overall in the past 39 days my sugar consumption has diminished tremendously. I am ok with the cheats noted above because they were one-offs during special times and not an emotional reaction reach for sugar. Sugar is in EVERYTHING. 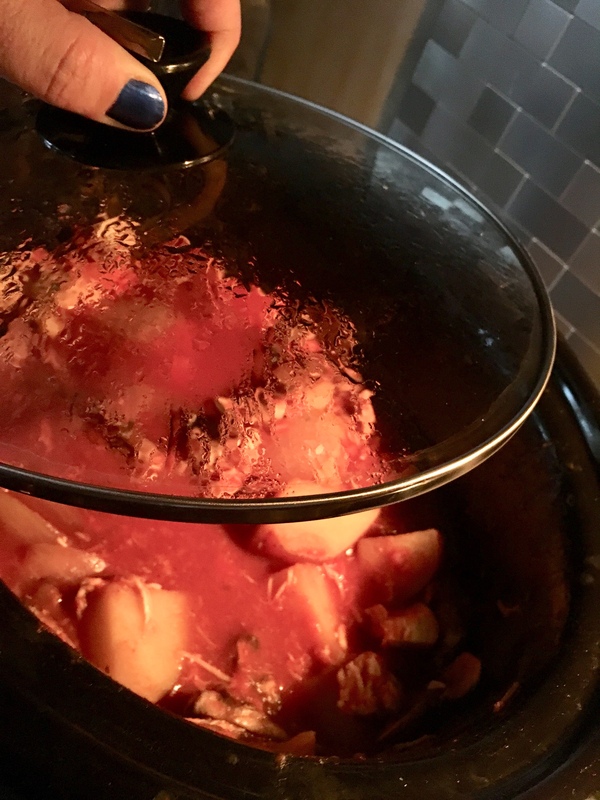 I cheated with my crockpot recipe that is at the bottom of this blog because of the sugar in tomato sauce. This will be something that requires prep-work before doing the actual program wholeheartedly. I am happy with my accomplishments so far but I know I have more work to do before I can successfully complete a true Whole30. Grains: this one I have already failed a number of times. I have had corn multiple times (I did not realize that corn was a grain, ugh), and rice with my sushi in MA. Rice is the most difficult. It is a main staple in our diet and easy to make on the fly. I have not stopped making it for Husband but I have made additional sides for me like zoodles or cooked cauliflower. It will require a different kind of prep work than sugar, but prep work all the same. My Overall Thoughts: I will be able to do a true Whole30 when I can put all of my efforts into it (i.e. lower travel month). I ordered the Whole30 cookbook not realizing it did not come with an instruction manual for the actual program. I need to become more familiar with all of the steps in the program and not think I can “wing it” by finding a blog that lays out the details. 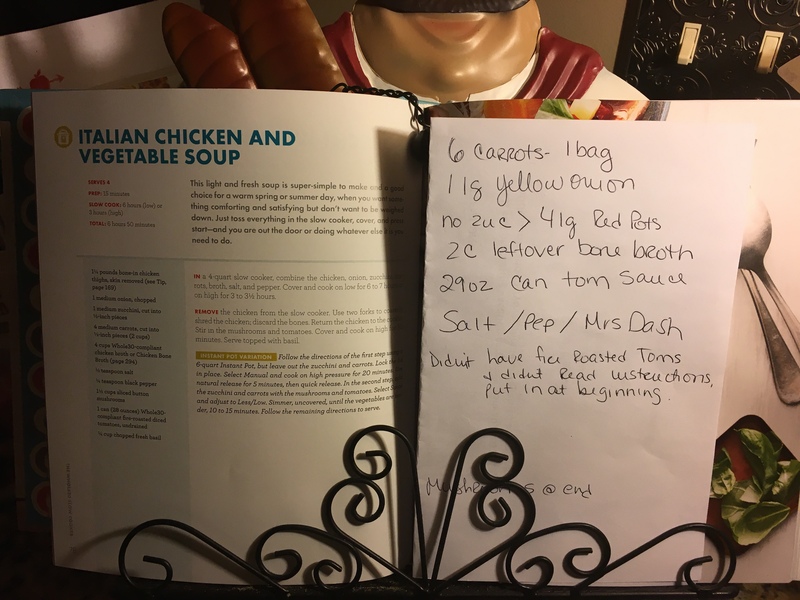 Part of the prep work necessary for this program will be shopping ahead, cleaning out cabinets and actually organizing my food catalog to be in line with the program. Do you have a nutrition routine that you are successfully keeping? I would love to hear about it! 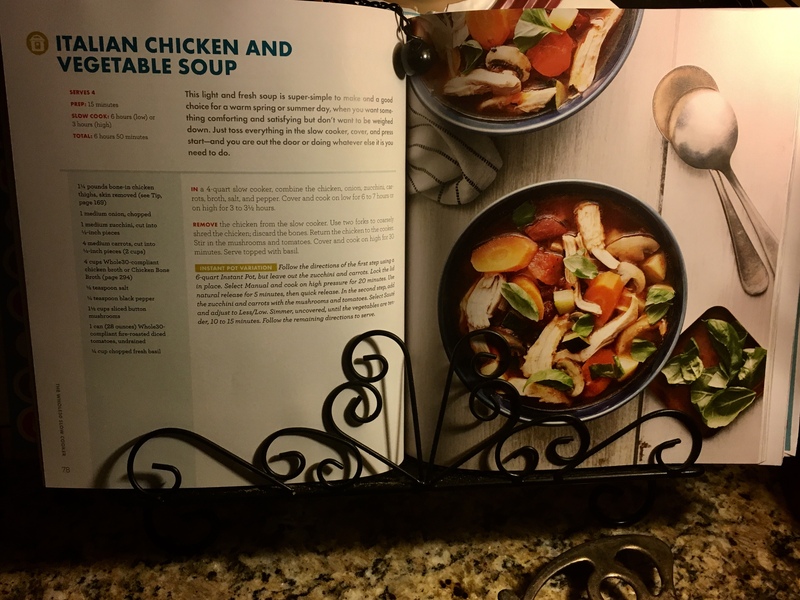 Below was my failed attempt at my first Whole30 recipe (improperly stocked pantry and lack of knowledge for the complete program were my errors). It was amazingly delicious though. I had leftovers that I put into containers and added cut zucchini, squash, spinach and bell peppers to. The thing that worked out for me was to start off with a ketogenic diet and then transition into paleo/primal. Nothing works without moderate exercise.